It has been a very long week. I don’t know what it is but I just realized what I’ve done this week and I feel like I did so much but so little at the same time. I got a new bank, my car broke, and got fixed (FOR FREE), I drove to Harrisburg, worked five days, found a rain jacket (FINALLY) and some other goodies at Goodwill for their one day only sale, house sat, held a kitten, and didn’t sleep in once. I have to say that I’m kind of glad this week is over. This upcoming week I get to see some friends and family and I’ll hopefully get my schedule and such for study abroad. I’m ready for lots of information. However, I’m also very ready to leave. Today I went to pick up my youngest sister from a friends house and I kept getting mixed up. I feel like I no longer know the roads I used to know like the back of my hand and that’s really weird for me. I missed a couple turns and made a few weird decisions about the way to go thinking they would be faster. I just don’t know. It’s weird. 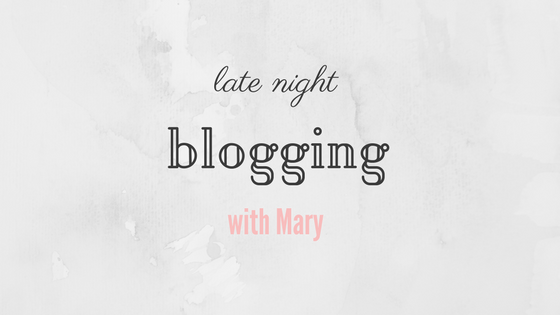 Also, I changed my blog theme, what do you think? I really like it for now. I have a very hard time making decision on what my blog should look like. I also have a Facebook page if you would like to like it! I would really appreciate that. I currently have “Friends” on but someone put the subtitles on and it’s driving me crazy. I would be fine with it if they were with the words being spoken but they’re very delayed. I’ve been doing a lot of study abroad research in my free time, and some of the stuff people have to say astonishes me. Like the girl who went on about how trashy leggings were and people shouldn’t wear them in general but she still wears them out sometimes. I just didn’t understand. There are some helpful things, but mostly it’s all the same. I don’t know if I have anymore late night thoughts other than I’m about to fall asleep. What are your late night thoughts? It’s funny, because every time I read these, it’s the next day and not night anymore! Anyway, I really do like your theme and the path really goes well with the whole “adventures” idea! You held a kitten? That’s so cute! Yesterday my dad took this picture for me of this adorable puppy, it was so small it looked fake! How’s everything for your study abroad trip going? I’m glad you’re finding stuff you need to take. I’d be your friend on Facebook but I don’t have one and I’m not really into the whole thing. Have a good day, Mary! It’s because when I put them up most people are already in bed!! Thank you! I really appreciate that! Yes, and it was adorable. I think anything small is just so cute haha. Everything is going well, I will finally get a good bit of information this week so I can’t wait. You too!! !